Despite occupying spaces retrieved from Haiti’s collective memory and while confronting issues pertaining to the Haitian and diasporic cultural identities at large, her characters are distinguished by their richness, individuality, and depth. 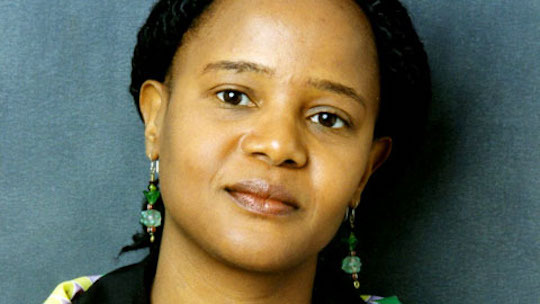 Danticat favors a more honest conversation between each of her characters’ unique personal attributes and stories and the historical and political context they inhabit. This dissociation from “theoretical dialogues” and archetypes remains consistent and deliberate in her writing. While her first book, Breath, Eyes, Memory, was published in 1994, Danticat began writing at a very young age and recalls having always been interested and invested in the tradition of storytelling. Her many distinctions include National Book Award nominations for Krik! Krak! and Brother, I’m Dying, American Book Award honors for The Farming of the Bones, and a MacArthur “Genius” grant, among others. Her most recent book, The Art of Death, a departure from the fictional genre, simultaneously constitutes a perspicacious and well-documented literary analysis and a deeply moving introspection on the purpose and portrayal of death in fiction. The book alternates between personal accounts of death in her own life and work, with a focus on the recent passing of her mother, and close examinations of its role in a variety of literary texts, some of which have influenced her own writing. Romie Desrogéne: You have said “writing has been the primary way [you] have tried to make sense of [your] losses, including deaths.” Aside from its healing component, why else do you write about death? Edwidge Danticat: I also write about death because it’s something that you can never really do with total accuracy, since death is unknowable. Dying, wrote Michel de Montaigne, is the greatest work we have to do, yet we can’t get good at it by practicing since we only experience it once. Dying, especially prolonged dying, is rarely passive or monotonous. Dying people are engaged in the most significant battle of their lives. Then there is the fact that death is the most universal experience of all since we’re all eventually going to die. I write about death to at least try to understand it better. RD: Cormac McCarthy once addressed the violence of his novels by suggesting that writers who neglect the issue of death are “not serious.” Do you agree with him? ED: I wouldn’t quite put it that way. I don’t think we all have to write about the same things, in the same way. I lean more towards what the narrator says in Don DeLillo’s White Noise about all plots moving deathward because death is the final conclusion of every story. So, even when we are not writing about death, we are in some way writing about it. RD: In your new book you discuss the question posed by Tolstoy in A Confession, “Is there any meaning in life that wouldn’t be destroyed by the death that inevitably awaits me?” Have any of your characters managed to answer that question for themselves? Do you personally lean either way? I think that’s often at the center of many stories. Why should I keep living? Will the character survive the story, or the moment of the story? How much will do they have to do it? And what makes them want to either live or die? So I think in life, as in stories, that question is being asked all the time, which is why it’s such a profound question. RD: As you take stock of other representations of death in literature, you write of a certain type of communion, a figurative sisterhood, with Zora Neale Hurston, Simone de Beauvoir, and Mary Gordon: “reading other daughters’ accounts of their mothers’ deaths” made you feel “as though we are all the daughters of the same mythical mother.” In response to a question posed to you by Opal Palmer Adisia about women’s relationships in your work, you said, “I don’t think of my characters as archetypes. I think of them as people, individuals like you and me. Otherwise, I’d be writing myth.” How do you write characters that gesture toward myth but cannot be reduced to it, characters that allow your readers to connect with you on that level—like Hurston, de Beauvoir, and Gordon’s—but do not conform to archetypes? ED: Observing people in real life offers some guidance. None of us are one thing. None of us are linear. None of us are perfect. We’re all messy and complicated, sometimes contradictory. We’re all nuanced. So I try to write nuanced characters who are often trying to figure out how to be the best version of themselves. Zora Neale Hurston, in both her own life and through the characters in her fiction, showed great examples of that. One of the reasons I love her memoir Dust Tracks on a Road so much—aside for the section I mention where she talks about her mother—is that it’s been contested so much. It’s as if she wants to stress that she’s writing her own truth, what she wants us to know from a subjective perspective and not a historical one. She was a very complicated woman, as was Simone de Beauvoir. I’m more interested in flawed people and characters than I am in mythic or archetypal ones. RD: How do you write about death as both a personal and a political event? ED: The personal is often political and the political personal. We cannot always separate them, especially when it comes to something as powerful as the end of life. So you write them as they might occur in real life. Sometimes they’re more visibly connected than other times. RD: Some of your fiction, and by extension your fictional representation of death, is based on non-fictional historical events (i.e. The Farming of Bones and the 1937 massacre). How do you navigate the relationship between history and fiction in your work? ED: I use fiction to fill in gaps and historical silences in works like The Farming of Bones. When I was writing The Farming of Bones, I would find brief mentions of certain events in an article, then I would do a lot of research and fill in the gaps with my story. Because I grew up with oral storytelling, this felt natural to me. When you pass on stories, whether they are things that happened or not, you often add your own touch to that story. You put your own imprint on it, which is of course influenced by our own sensibilities, passions, and concerns. RD: You evoke the Bible at several points in the book, both in your analysis of the representation of death in other books and in detailing the sources of solace you found after your mother’s passing. How does Christianity affect your understanding, fictional representation, and experience of coping with death? ED: My mother took a lot of comfort in the Bible at the end. She was a very devout Christian and loved reading the Bible. At the end we read the Bible together a lot and I realized that she was trying to form in her mind a much clearer sense of what her afterlife would be like. Through those evenings with my mother, I was also able to appreciate the Bible as a literary text, to examine more closely all those literary tools used by the Bible writers, the imagery, the lyricism—since this is also a book about the craft of writing, I wanted to point out that the Bible is a book that writers can look at whether they believe it or not. RD: In the same vein, how much of your fiction makes implicit or explicit references to Haitian Vodou? How has Vodou shaped your understanding of death? ED: I don’t know if there’s a percentage. I am neither an expert on Christianity nor Vodou, but I have written about both to the best of my ability and I have written about real people as well as characters who practice either or both religions. I have written about people who believe, like my mother, that they’re going to heaven when they die and others who believe that they’re going back to Ginen, the home of our ancestors. That’s certainly the case of the family in Breath, Eyes, Memory and others in Krik? Krak! Often the way you view the afterlife shapes your view on death and dying and the rituals that precede or follow dying. I don’t go too far into this in this book, but I write a bit about it in a piece I wrote for The New Yorker in 2011, which ended up in my book of essays, Create Dangerously. RD: You say that your mother “wouldn’t have been funny in English.” Can you tell us more about the complexities of writing transnationally, particularly when it comes to translating humor or more culturally contingent modes of thought or feeling? ED: My mother’s kind of humor was very nuanced. You had to know her culture, then you had to know what she was like normally in order to understand her jokes. Some kinds of words, phrases, and experiences are like that. They’re hard, if not impossible, to translate. Writing across languages, you’re always aware of that. Sometimes you just have to put a phrase in the way it is in the original language and allow the reader to experience it. Sometimes you have to evoke a parallel experience or word. People who live transnationally, if you will, experience that on a daily basis. You just have to do the best you can and get as close as you can to what you’re trying to say. The Italian expression, “traduttore, traditore” is sometimes correct. In French it is “traduire, c’est trahir.” The translator as traitor. You’re going to betray something or fail someone whenever you translate, whether it’s words or experiences. You’re never going to make everyone happy. RD: Some multilingual writers choose not to translate words from other languages into English for their readerships. I noticed that in both The Art of Death and Krik? Krak! you often provide a literal translation of Haitian Creole expressions and a more in-depth contextual translation when necessary. These translations are embedded in the text immediately following the Creole, in lieu of footnotes or parentheses. Why do you choose to include them? ED: I like the idea of someone who speaks both languages coming across a translation that they either agree with or want to challenge. We all use language so personally that glossaries can’t be totally accurate in a subjective text like a novel. Or in a short story, or a poem. A glossary does not convey the tone in which words or phrases are said. I translate words and phrases myself and I do it inside the text because I want the reader to at least know what I think the characters would be saying if they were speaking English. I think that’s a little more nuanced than having them google the words or look them up in a glossary, which might interrupt the reading experience. Plus this is often how a lot of us speak, at least a lot of us in my family. I just wanted to honor that.